The president was the last one to be convinced. Dr. Ronald E. Carrier never really said he was against changing Madison College 's name to “university” but, on the other hand, he never really said he thought it was a particularly good idea either. The name-change subject would invariably come up in the mid-1970s at meetings of the President's Cabinet – Carrier's vice presidents and a few other key administrators. Carrier wasn't convinced. And why should he be? Things were going great as “ Madison College.” It wasn't broken, so why fix it? In many ways, he was right. Madison College was doing just fine as a “college” in the mid-1970s. Enrollment was nearing 7,500, almost double what it had been when Carrier became president in 1971. Nearly 6,000 students applied each year for a spot in an entering class of less than 1,500. SAT scores of entering students were on the increase. Madison athletic teams were prospering, with the men's athletic programs poised to move to Division I of the NCAA. Madison College was plenty successful – but those were the very reasons that most members of Carrier's Cabinet pushed relentlessly for the school to seek university status. All of those many positive things added up to mean that Madison was really a university, not a college. Its name ought to reflect that. The man in charge of presenting Madison 's image to the public, Sonner knew there was a lengthy list of other good reasons for the name-change: It would make the school more attractive to quality faculty and students; enhance athletic scheduling; provide better job and graduate school opportunities for alumni; and greater opportunities for government and foundation grants. In addition, Sonner and others argued, it would eliminate forever the lingering perception many Virginians still held of Madison College being an all-women's teachers college. After weeks of cajoling and coaxing by Sonner and others, Carrier finally relented – sort of. Carrier called on his staff to convince him: Okay, he said, go out and prove that Madison College really deserves a new name. “I wanted to make sure the name-change was really warranted and that it wasn't just a product of our public relations program,” Carrier recalled recently. Finding an issue that any group of faculty anywhere, any time, will agree on 100 percent is virtually unheard of, but this was about as close as you could come to unanimity. There was no real opposition and the only question raised at the meeting was the appropriateness of having a “university” with no doctoral programs. Sonner's staff had already thoroughly researched the question and he quickly pointed out that a huge number of “universities” did not offer doctoral programs. Sonner and his staff knew that it would take more than an editorial in the student newspaper to totally sway Carrier as well as the group that would ultimately have to request a name-change, the Madison College Board of Visitors. During September, Sonner's Division of Public Affairs polled the student body, faculty, staff and a 25 percent sampling of alumni. The survey simply asked if Madison College should be re-named with the new name using the word “university.” Those who answered yes to the first question were given a choice of voting for “James Madison University,” “Madison University,” or providing a write-in choice. The results of the balloting surprised even the most ardent name-change proponents. There had been some anxiety that a sizeable number of older alumni might chafe at re-naming their school. Not so, 88 percent of the alumni voting – the highest percentage of any group – supported the name-change. Even the Class of 1914 weighed in favorably, with both of that year's graduates who voted supporting the name change. No one really anticipated any difficulty in winning approval from the legislature but Ray Sonner didn't want to take any chances. A political firestorm had erupted in Maryland when Towson State College wanted to become a “university”; talk of Mary Washington College changing its name had created a furor among that school's alumni. Sonner expected that Madison 's name-change would sail through the legislature. But that wasn't enough. He wanted a unanimous vote. The major tool used by Madison College in presenting its name-change argument was a no-frills, 16-page booklet titled “The Case for James Madison University.” The pamphlet was produced with private funds to avoid criticism of using public funds for a lobbying purpose. The document outlined all the reasons for changing Madison 's name, countered any potential arguments against the name-change and listed a number of governmental and civic groups that had endorsed the change. Copies of the booklet were sent to education writers and editorial page editors at newspapers around the state, resulting in several supportive editorials. 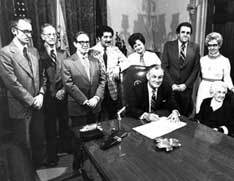 A copy of the document was placed on the desk of each member of the General Assembly when the legislature convened in January 1977. Two local legislators, State Senator Nathan Miller of Bridgewater and Delegate Bonnie Paul of Harrisonburg introduced the legislation in their respective chambers of the legislature. Dozens of other legislators agreed to co-sponsor the legislation. Carrier and Sonner lobbied for passage of the bill but their efforts probably weren't needed. The General Assembly action was almost anticlimactic. The bill passed unanimously after sailing through both the House and Senate without any opposition expressed in committee or floor action. The next step was the third floor of the State Capitol. 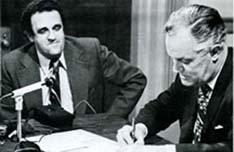 On March 22, 1977, Governor Mills Godwin Jr. – the husband of a Madison alumna – signed the legislation creating James Madison University, six days into the 70th year of the institution's existence. On the evening of June 30, the JMU Women's Club threw a big party in Chandler Hall to celebrate the new name. 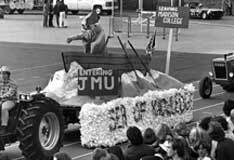 At midnight – the exact time of the name change – champagne was poured and a huge cake bearing the name “ James Madison University ” was cut. By July 1, 1977, much had changed on campus and in Harrisonburg as well. 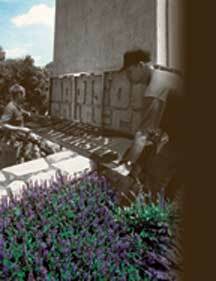 New signs bearing the name “ James Madison University ” were in place at campus entrances. Departments had stocked up on new James Madison University stationery although faculty and staff had promised – with their fingers crossed, no doubt – not to use any of the new stationery until the old “Madison College” supply was exhausted. Everyone seemed to magically run out of “Madison College” materials on July 1. Names other that of the school changed on July 1. The “College Market” on Port Republic Road became the “University Market.” “College Motors” became “University Motors.” The Warren Campus Center became the “University Union.” Sonner's Division of Public Affairs turned into the Division of University Relations. A special 16-page section appeared in the July 1 edition of the Harrisonburg Daily News-Record heralding the arrival on the nation's newest university. Extra copies of the special section, with its main story titled “James Madison University Is Born,” were printed and mailed to JMU alumni and donors. Twenty-five years later, Carrier and Sonner are in complete agreement that the name change was much more than cosmetic. “We wouldn't have the multi-purpose institution that we have today if we hadn't added the ‘university' designation,” Sonner said. Carrier was even more adamant: “Once the change was made, it allowed us to move up in programs that put us on a par with other universities.